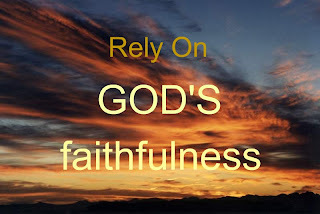 Psalm 89:33...But I will not withdraw My faithful love from him or betray My faithfulness. I have lost count of the number of times I know I have disappointed God. It breaks my heart and frustrates me at the same time. Why at times do I choose the wrong path? Why do my selfish, prideful tendancies take center stage? Do I consciously tell God to take a step back, or do I give Him a forceful push? However I do it, it always results in me feeling like I don't deserve His love and grace. When will He throw up His hands and say, "That's it! I give up on this girl!" The answer, praise God, is never. Regardless of anything we do, He NEVER withdraws His love from us. He remains faithful even when we do not. When we take our eyes off of Him and turn to sin, may we never forget that He never takes His eyes off of us, not even for a split second. His faithful love endures forever.